Understanding how to use the huge body of work we call WCAG 2.0 means understanding that the work began as a collaborative effort to define the 4 Principles of an accessible internet site, which after a decade of ongoing consultation with an ever-growing international community are now guidelines—not exactly the same as “rules”—and a list of criteria—things front-end developers must, should, and can do—to succeed at removing the barriers some groups will otherwise face when accessing and using the internet. Because the list is not prescriptive, but offers options, it seems of the utmost importance to first know your audience, and next, to understand as the Web Consortium’s Accessibility Group sets out in WCAG 2.0, the best way your organization can guarantee your audience access to your content. David Berman said in his workshop, and I think it makes perfect sense, that the differences between accessibility and usability are, for all intents and purposes, purely semantic. Providing access for people with varying abilities, simply makes things more usable for everyone. As I said earlier, there are 4 Principles. Websites must be 1) perceivable, 2) operable, 3) understandable, and 4) robust. If you like acronyms: POUR some accessibility sugar on me (use <abbr title="Spelled Out">SO</abbr> to create tool tips screen readers can use)! Each principal has “guidelines, “…which are further categorized into levels. Level A must be done, or some group will not be able to access the content. Level AA should be done, or some group will have difficulty accessing the content. Level AAA can be done to improve usability or enhance accessibility further. Too many windows causes problems in understanding, which is principle #3. This can be especially challenging for those with disabilities related to vision or cognition. The Understanding WCAG 2.0 site provides information by which to understand each guideline, and provides “success criteria” so you know when you’ve achieved each level, and examples of techniques you can use to get there. “Success criteria” are written as statements that are recognizably/measurably false until one meets the guidelines. The problems that prevent the statement from being true are your challenges to overcome. Know your organization, your audience, and your content. Use valid HTML wherever you write code. If most of your site visitors are knowledgeable about technology it may not be necessary to open new windows, as they will use their familiar browsing setup to choose when and how to open them, and if your code is valid it will work as they expect. There’s no WCAG 2.0 guideline that says not to open new windows, but we must think more carefully about how doing so may create barriers to ease of access and use. 3.2.5 also has an “Advisory” about additional techniques. I don’t want folk leaving my pages abruptly or permanently, and I don’t think all my visitors know everything about their browser’s and other equipment’s context-sensitive help menus, access key options, etc., so I’ve elected to automatically open some content in new windows. I’ve decided I can sensibly limit the number of windows that open from any of my blog pages to a maximum of 2 by applying a simple self-enforced rule. I’ll still use the target attribute, but instead to create one “named window” for links to other areas of my site (rcfWin), and one “named window” for links to external sites (extWin). I’ll open all external links in their own window, which means I can easily design something that will apply retroactively to all such links. Go to the API selectors page and scroll down to Attribute Starts With Selector [name^="value"] to get the syntax. I want to select all the links (a) with an href attribute whose value begins with http:// (or https://). We can get away with [href^="http"]. I have to weigh all the advice to find the best way to handle my internal links. If you’ve linked text in the middle of one article to another article there’s a distinct chance the user will click it and start reading. If you don’t want that, the most sensible choice is usually to lose the link—link only at the end of the information and only to the next logical jump in a sequence. But if you feel you must have the option, to keep it as an available option you can create a CSS class name and tell jQuery to look for that. You’ll still have to add it manually to any links, past present or future, you want to behave that way. Or you could do it the other way around and use your class to prevent opening in another window or tab. * Aside: I’ve already manually removed the http://www.rcfouchaux.ca from internal links because of its effect on WordPress “pingback links,” which I’ve got going on here. I’ll have to explain those later, but it comes in handy that I’ve done this, as you’ll soon see. This blog just turned 3, and I’ve got a lot of blog pages. I have to find some way to automate at least some of this. I might have used target="_blank" sometimes, and not others. I might have already used target="extWin". /* wp_head() before closing </head> tag. /* Include own script(s) AFTER wp_head() tag. Thereafter you make changes to that file and then replace it on the server. Keep in mind that header.php will be over-written if and when you update your theme, so keep backups of any code you add. There are nearly always more than one way to solve a problem with jQuery. My general approach will be to create a function as the page loads, and call it when the page is ready. I’ll supply more details in the code comments! To recap: we’ll take all http links and assign target=”extWin” regardless if they’ve got a target attribute set or what it might be set to. We’ll also create a class name to apply to internal links we think should open their own window, but never the same window an external link may already be open in. Bonus: We’ll add the sentence ” … Opens in a new tab or window.” to every link that does that. Because this last bit of code will be repeated in both the previous functions we’ll write it as a standalone function in its own right, and call it from the other two when needed (those jQuery.each(); loops that repeat in each function are good candidates for the same treatment, but I left it so you can better compare what’s happening in each case). // Declare variables in a single statement at the top of the script. // Create two functions to set the targets on the two sets of elements. // Go through each item and get its title if it has one, or set it to an empty string. I’ve coded all the external links in this post differently, but they should all open in the same tab or window. Hover your mouse over any links on this page to see if the ” … Opens in a new tab or window” notice worked. Here’s a class="open-in-rcfWin" internal link and here’s another one. The next one has no class set, so it will replace the content of this page with the home page: ciao for now! What can I learn playing with bookmarklets? I started with a pet peeve about a page I visit regularly. My first bookmarklet ever hides the right column in Facebook, so I don’t have to see the ads. Take that, Mark! If you click the link below while on this page nothing will happen. But if you drag the link to your Bookmarks Toolbar (in Firefox, “Bookmarks Bar” in Chrome, etc…) do that while viewing your Facebook page (or any page that coincidentally has a right column div with id="pagelet_side_ads") you will toggle its visibility. Bookmarklet1: Toggle FB ads Drag the link to your bookmarks bar to try it. I may explain this code in another post, but for now it’s about bookmarklets and an example of what one might do with one. If you don’t understand this paragraph you’ll need to do some vocabulary homework. This script only works at www.lyrics.com. That page has a version of jQuery installed so I used it. To write the script I used Firebug to identify IDs and classes of elements on the page that I use as “selectors” to have access. I fiddled in the console until I had a working script. Meticulous syntax is important… your script goes on one line, so semi-colons are in, comments are out. This script is quite a bit more involved than the first. I did succeed in making it work in the link code like the first one, but there’s an easier way. In order to make more complicated scripts work you should use the bookmarklet to load your script from a file on your server. I created rcf-get_lyrics.js and placed it on this server. You can copy/paste the script below and just change the path to point to your own file. I’ll discuss the code in more detail in a future post, but quickly, you create a script element and set the source to the file, then append this new element. There’s a unique identifier, which I’m not using for anything right now, created from the time and appended to the url. Alan’s script demonstrates how to load a complex script off a server using only a small manageable amount of code in the bookmarklet itself. As you see, I borrowed it but removed his protocol check for simplicity. I think the aforementioned date/time “query string” he adds prevents the browser from caching the script indefinitely, but I didn’t research that—it’s a guess. Another impressive project that’s available as a bookmarklet is pjscrape. If I wanted to turn my lyrics scraper into a real utility I’d probably start with pjscrape. Update 2: I’ve placed both the bookmarklets on their own page. I expect I’ll add to the list. Update 3: I’ve added a variation on the Facebook ad hider, using display:none and targeting only the ads—compare the two and try to figure out what’s different. I’ll add all future updates on the bookmarklets page. Multimedia in eLearning? Bring Popcorn and Butter! I’ve already noted an irony… I was unable to watch these videos on my iPhone, and yet I uploaded HTML5-friendly .webm files. That seems to be about YouTube, though, not Popcorn. Will Popcorn and Butter disrupt Adobe? You won’t see it on corporate training sites any time soon, but you can rest assured the number of people who know what it is and try to use it will surpass Captivate’s in a short time — and they’ll have lots of fun at https://popcorn.webmaker.org/ exploring ideas and re-mixing the ideas of others. I’ve only just begun exploring this exciting new resource. I hope you will join me. I’ve already encountered some PopcornMaker gotchas, including an inability to reliably hold HTML code in Text or Popup events, making it difficult to do some of the lessons I had in mind. I expect to write a few more blog entries on Popcorn, and though I got a late start I’m taking part in Teach the Web: a Mozilla Open Online Collaboration for Webmaker mentors. I’ll have much more to say, and I’ll tackle the gotchas, when I see and hear how others have approached this fledgling resource in the 21st-Century-Educator’s repertoire. My project within a project within a project was accepted. I’ve got some final edits to make and constructive criticisms to apply, and I’ll receive my M.Ed. in June. But the best news is, I’ve got a friend with a class who are up to the challenge, we’re working out details to actually build mobile-friendly web apps. But wait! There’s more! I’ve just been tweeting with PLN interested in this and/or similar ideas. I’m quickly going to summarize some of the constructive criticisms I’m talking about, and in so doing reveal what I think comes next, at least for me. The nature of this thing is you can pick and choose what parts might be useful to your own endeavors, or join in and help set the course of this one, branch off on your own at any time, or lurk and watch what happens to the rest of us. It does not require Internet, only computers. The experience will be better if computers can share a network; Internet makes it all much easier, especially such rewards as viewing your work on smart phones and sharing with family/friends. The project needs a goal—context and boundaries. A simple instant gratification version of this activity can be done if each participant has an image of themselves and 2 or 3 documents of some kind, for example assignments… poetry, written work. It might take the shape of About Me, or My Work in Grade x. In my imaginings, participants have something with their picture and things they’ve created inside it, and they have just grasped a sense of how to control those things using buttons and links. I believe if I do that correctly, they want to go further and do more, and they tell me so. I prepare for that. Each student needs a USB stick, even a 1GB will do. If you have limited computers you need to set up timesharing; the USB travels with the participant. The only premise I have so far for a group version is whatever the students do individually, the teacher compiles as a class page. Teacher should do the individual activity up front, but you’ll be learning with the class, too. You should hunt down things you need and people who can help—the class’s PLN. A “thicker” (rife with teachable moments, methods, strategies) scope might be My Community, and an extension Project-Based learning situation could have reporters, videographers, copy editors… the class decides the organization’s structure and “business model,” create jobs and hires each other to fill them. I’ll respond to comments on this blog, on this or any other post, but I’ll also welcome and incorporate ideas of others. I may add to this post, and I’ll write Updated at the top if/when I do. Entrepreneurship is a 21st century competency in both C21 (Canada) and P21 (US). Instant gratification as intrinsic motivation. I’ve said this a few times, but I’m coming to believe my point is largely being missed. I think if the point’s worth anything at all it’s incumbent on me—the communicator—to give it another try. Authenticity in learning can be understood as the extent to which the learning is situated within a practising community of people who share some united interest in the knowledge being sought or produced, and a common idea of its meaning and value, “…who share a concern or a passion for something they do and learn how to do it better as they interact regularly” (Wenger, 2006) Sociology is an integral element of the authentic learning environment. Several authors have argued that rather than this being a drawback, this characteristic offers benefits for learning. Educause (2007) suggests this helps develop skills “in thinking clearly and communicating effectively”. Rankin (2009a & 2009b) notes that this forces students to focus on a central point. Dunlap & Lowenthal (2009) argue that communicating in this style is a “professionally useful skill for students to develop”. …However this aspect of Twitter, …has also been blamed by academics for contributing to declining English writing skills (Kelley 2010). There is now plentiful evidence that a growing number of educators, and many more who think of themselves as stakeholders in education generally, are using social networks, and more than a few sites and software applications have emerged to compete for parents’, students’, teachers’ and administrators’ attention, everywhere, all at once. There are powerful new ways to create, manage, and share your own resources and an overwhelming number of great resources available from others. While a site like Pinterest may drive a great deal of traffic to blogs the micro-blogging tool Twitter’s unique feature set has helped establish its role at the hub. Social networking platforms and tools are already impacting and supporting learning in at least three ways. First, social networking itself is a tool with a skill set for learning. Second, social networking can be used to deliver and enhance curriculum. And third, social networking can be utilized to create learning experiences in collaboration with others. Teachers find individual articles such as 30 Twitter Hashtags For Science Lovers and 50 Ways to Use Twitter in the Classroom immensely helpful, but if my own timeline is an indication, they do add up! Most of probably hundreds of such no-doubt wonderful ideas often get swept away in the “digital noise.” A classroom teacher’s bookmarks can include Edmodo, YouTube, and Facebook, Teachhub, PBL-Online and Edudemic, but it’s increasingly clear that Twitter is the choice to join these spokes at the centre. New Twitter users commonly describe an experience curve that travels from scepticism, trial participation, conversion (getting it), dramatically increasing usage and connections (Levine 2007, Stevens 2008, Seimens 2008, Shepherd 2009) through to potential overload (Sierra 2007). Teachers use Twitter to plan field trips, chat with industry professionals, connect classrooms, facilitate research, post supplementary materials, to engage students in the classroom, parents outside the school, and colleagues and administrators in networks they can design according to need and interest. It’s not surprising to learn that “design of teaching strategies and practices related to virtual engagement and collaboration is instrumental to achieving positive educational outcomes,” but some early research suggests not all are equally ready, that students may need “…to improve their capacity to initiate self-directed, collaborative practices as a means to more effectively take ownership of their learning” through incorporating new technology. (Junco, Elavsky, and Heiberger, 2012). Similarly for teachers, learning to use Twitter to grow an effective Personal Learning Network (PLN, a.k.a. Community or PLC) is not the same as learning to use it as a tool in a learning situation, in or out of the classroom. What you Tweet, when you Tweet it, the length of your Tweets, whom you retweet and who retweets you are all factors in getting established on Twitter. You can over-use hashtags or under-use them, and good use of images in tweets can make your tweets up to twice as engaging. TweetStats is a service that reveals a great deal of information about how people actually use Twitter. One tab shows how many Tweets happened, when, in reply to whom, from what kind of device, and top retweets for a particular user. On another you can visualize the data as a word cloud1 (called a TweetCloud, naturally) of top mentions and topics, and once you’ve done so for an account you can track follow and unfollow stats from that point forward. If you have an idea of a rubric2 demonstrating engagement and on-task behaviour, or other standards you wish to establish, either for your personal learning community or a learning experience you design, TweetStats can already report some enlightening information. It seems to me this is a direction in which educators can push for development, or show initiative by launching their own open source projects. As a stakeholder in on line education, what other sets of data would you like to see in statistical reports? Must diagnostic, formative and summative assessments be built in? How would you do that? What would it look like? From visual design, a word cloud is a form of weighted list, a visual representation for text data. Usually the importance of each tag, word or phrase being highlighted is represented by variations in font size or color. A rubric is a measuring tool that experience designers can use to assess participant learning and engagement. Using a set of criteria and standards directly tied to the stated learning outcomes, educators can assess each student’s actual performance. When a rubric is agreed-upon and communicated prior to the student’s work being completed, it serves as a model or exemplar, and makes the grading process clear and transparent. Brown, J.S., Collins, A., and Duguid, P. (1989). “Situated Cognition and the Culture of Learning.” Educational Researcher, 18(l), 32-42. Davis, Gordon B., Editor (1986) Understanding The Effectiveness of Computer Graphics for Decision Support-A Cumulative Experimental Approach, Communications of the ACM, Vol 29 (1) 40-47. Dugan, Lauren (2012) How Frequently Should You Tweet? [STATS] posted October 30, 2012 on AllTwitter The Unofficial Twitter Resource http://www.mediabistro.com/alltwitter/how-frequently-should-you-tweet-stats_b30568. [Available on line http://www.ascd.org/publications/educational-leadership/feb10/vol67/num05/Why-Teachers-Should-Try-Twitter.aspx, retrieved 2012-11-30]. Lave, Jean and Wenger, Etienne (1991). Situated Learning: Legitimate Peripheral Participation. Cambridge: Cambridge University Press. Lave, Jean (1996). Teaching, as Learning, in Practice, Mind, Culture, and Activity (3:3) pp149-164. Wenger, E. (2006) Communities of practice, a brief introduction, http://www.ewenger.com/theory/, HTML retrieved 2011-11-03 or http://wenger-trayner.com/wp-content/uploads/2012/01/06-Brief-introduction-to-communities-of-practice.pdf, PDF retrieved 2011-10-03. Some best practices for posting infographics? As often happens when we go searching the web for something, I ended up with something else, and learned something different than I started out to learn. I was searching for statistics about social media. I soon discovered how pervasive infographics have become, even compared to six months ago. When done well they are clearly very good at presenting data quickly and coherently. But there are some other things I expect when I go searching for data, and they seem to be as easily overlooked as they could be to include, if only we take the extra couple minutes to consider. I believe I’ve also seen some hints that with infographics it may even be easier to misrepresent and distort data than with such well-known devices as bar graphs, and well understood yet often repeated practices such as moving the origin to influence scale. Information graphics or infographics are graphic visual representations of information, data or knowledge intended to present complex information quickly and clearly. They can improve cognition by utilizing graphics to enhance the human visual system’s ability to see patterns and trends. The process of creating infographics can be referred to as data visualization, information design, or information architecture. Infographics aren’t new. The article above links their origin to cave paintings. I remember posters in my doctor’s office in the 60s that fit the description. Neither myself nor most of the adults in the waiting room would have been likely to pick up a peer-reviewed journal or seek out the study that uncovered the data being presented. There would likely be some fine print in the corner that indicated who prepared it, and you could track it down if you were interested. In the information age and on the World Wide Web that would be both lazy and unacceptable. For end users with sight, graphic presentation of data on the Web may be even more effective in some cases. Whether graphs are actually superior to tables—in business decision-making, for example—has been a bone of contention for some time (e.g., Davis, 1986:46-7). I would suggest that on the World Wide Web the ability to select, copy and paste the text in a tabular display would in many cases be more satisfactory to many end users than an attractive display that was perhaps not as portable. One “solution,” or perhaps just a happy accident, is that many infographics are posted as PDF files1. These can support embedded links, can be downloaded and printed maintaining the integrity of the original (and its copyright notices, etc.) and in many cases support copy/paste. PDF files can be made accessible; that becomes a process that must be included in the development cycle. As I’m writing this, it should be noted, only certain WebKit browsers—Chrome, Konqueror (Linux) and Safari (Mac only)—display PDF files without additional software. Native and open formats like PNG are more universal. In my opinion SVG is the one to watch. It’s a “vector” graphic format, which means it maintains quality at any size. Most newer browsers will display SVG, and the spec contains some very exciting abilities of the “coming soon” variety, such as zooming, timecode and animation, that should greatly enhance our ability to organize and communicate the meaning of data. In either case you should put references, links, and anything else your visitor may want to know that isn’t in the data itself in plain text in a caption underneath. If you’re on WordPress there’s a caption box in its standard image upload form you can use. Regardless of platform this should be relatively easy and may go a long way to advance the usability and usefulness of your data. Infographics may contain mixtures of several types of data display, including graphs and tables. All of the abilities to distort and misrepresent data, whether intentionally or not, are therefor multiplied. A prime example is this infographic released by the US Republican Party to convince their constituency why they believed the Affordable Care Act was a bad idea. A combination of illogical colour use, bad layout, poor choice of fonts and font-size, meaningless relative proportions and little white space make the system it claims to represent look overly complex, and to many perhaps, even ugly. On the site where this lives commenter Nick Dobbing, founder and principal designer at Wovenland Systems in Vancouver points out, “Notice all the bright primary colours in the chart, all the many different shapes, with no sense or order in the way they’re used. 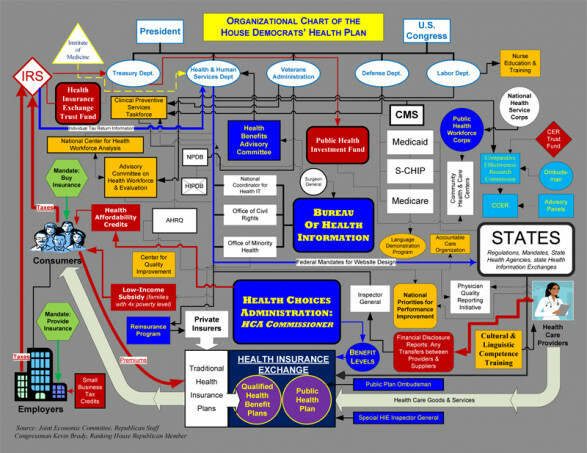 No help to anyone sincerely trying to comprehend the diagram… but boy howdy, it sure makes it look more complicated! And that’s all that this diagram is about.” When other designers redid the graphic with a commitment to display the information with integrity it looks quite different. I’ve included only the portions relevant to my discussion. Recently, you released a chart purportedly describing the organization of the House Democrats’ health plan. I think Democrats, Republicans, and independents agree that the problem is very complicated, no matter how you visualize it. By releasing your chart, instead of meaningfully educating the public, you willfully obfuscated an already complicated proposal. There is no simple proposal to solve this problem. You instead chose to shout “12! 16! 37! 9! 24!” while we were trying to count something. I have removed the label referring to “federal website guidelines” as those are not a specific requirement of the Health and Human Services department. They are part of the U.S. Code. I should know: I have to follow them. I have relabeled the “Veterans Administration” to the “Department of Veterans’ Affairs.” The name change took effect in 1989. In the future, please remember that you have a duty to inform the public, and not willfully confuse your constituents. Many sets of data may form lovely graphics that are nonetheless too large and complex to fit a single browser window. In my experience a popular solution is to make the graphic longer, not wider. This is in keeping with a standard web mantra that vertical scrolling is okay, horizontal scrolling is bad. I’ve read recent reports that scrolling is less a big deal to those who’ve grown up on the mobile web, and it’s easy to find designers who agree. I’m a centrist in this case, I much prefer to get what I came for front and centre, but I’ll adapt and go with the flow—if it’s clearly a flow, not an eddy. data-mySource="Fouchaux (unpublished manuscript), Answer to the Ultimate Question of Life, The Universe, and Everything"
I think I’m getting some ideas about possible best practices for posting infographics. Please use the comment section to critique my suggestions and to offer your own. The most useful format when the graphic contains links, references end users may want to paste into a Google search, or the document is to be printed or downloaded is PDF1. However, currently only WebKit-based browsers: Chrome, Konqueror (Linux) and Safari for Macintosh can display PDF without additional plugins, PDF files can be large, and they require extra care to assure accessibility. Unless I absolutely need my audience to download and print I’d be inclined to post a PNG (all browsers) or SVG (all newest browsers) image and include links, references and citations in a plain text caption underneath. Mayer’s principles of multimedia design, especially concerning coherence and spatial contiguity, apply. Good use of whitespace, a sensible colour scheme are key, but these are indicators of good design in any medium. Illogical colour use, bad layout, poor choice of fonts and font-size, can obscure, distort, and render meaningless any set of data. I’m personally not a fan of long, skinny and scrolling. Unless the data demands otherwise I’d try to keep all the information visible at once. If scrolling is necessary there’s still general agreement that it should be vertical. PENN State’s Image Maps in HTML explains image maps and how to make them accessible. Note that PDF (in strictly speaking) is not an image format, but a scriptable rich text document format that can contain different types of multimedia content, including vector and bitmap graphics, audio, video, forms, intra- and inter-document hypertext links and a hierarchical contents listing. You should handle accessibility outside the web browser before attaching your PDF. I began to show some actual code1 [to see my “footnotes,” press the number; to close them, click or press Esc] which creates a style that can be applied at the paragraph or section level to assign an icon signalling its content or relevance to the document. I used narration, in the form of recorded audio, with pictures timed to coincide with words—a concept that is the basis of almost all elearning software, TV advertising, documentary film, even political propaganda—to explain and demonstrate what I was thinking about the topic and the technology. If you’ve followed this Cognitive Apprenticeship from the beginning I hope you can start to see now how I’ve intentionally set out to contrast a traditional academic style with an increasingly Web-enhanced one. In so doing I used technology to solve some problems—and predictably introduced several more, demonstrating another potential technology holds, one I suspect we all have experienced. Software often contains bugs; preparing a lesson plan using pen and paper, or presenting using a comfortable and familiar paradigm such as a slide show with handouts one often feels more in control. It’s often too easy for the technology to become the focus, and not in a good way. But while many classroom teachers tell me anecdotes that conclude with a student fixing something, far fewer tell me they’ve learned to embrace that as a strategy, and are willing to jump in the deep end head first, with ample faith that together they’ll tackle whatever obstacles arise. It’s my personal goal to foster that confidence and empower educators to create such environments. Indeed, I feel there’s a certain urgency, not just for individual teachers or the profession, but for the future of public education itself. Ursula Franklin, in her famous 1989 Massey Series lecture, noted the changing role of technology and important ways it was changing the role of technologists, distribution of labour, and the balance of power, while in her view shrinking the public sphere. The situation in the classroom at the interface between the biosphere and the bitsphere is but one facet of the situation in the workplace within the same realm. In fact, often even the designation of workplace is no longer appropriate. Not only do new technologies, new ways of doing things, eliminate specific tasks and workplaces… but the remaining work is frequently done asynchronously in terms of both time and space. Her distinction between what she identified as prescriptive approaches2 versus holistic3 ones led to a concern that not working together in the same space causes “opportunities for social interactions, for social learning and community building [to] disappear.” (Franklin, 1992:172). A neoliberal market model of education is paired with a neoconservative social model that work together to “change people’s understanding of themselves as members of collective groups” (Apple, 2009), a course at odds with public education’s heritage of citizenship-, character-, and democracy-building. An aggressive and well-funded movement is under way that “supports marketisation through its clear preference for incentive systems in which people are motivated by personal, not collective, gain rather than by the encouragement of social altruism. Yet, the tradition of social altruism and collective sensibilities has roots just as deep in our nations, and its expression needs to be expanded, not contracted.” (Apple, 2004; Apple, 2009). Neither of the above authors in the works cited alludes to what I believe can only be described as a new literacy for the 21st century: fluency in coding and code. At Occupy Wall St. the techies “[built] websites, put out messages, manage[d] the ebb and flow of information about the occupation on the Internet.” (Judd, 2011) A year later “TechOps,” as the New York contingent of web-developing occupiers call themselves, built and maintained the website for the Sept. 17 anniversary events. They put together a whole host of other underlying technical infrastructure… TechOps-built database software sits behind a system to match people who needed a place to stay during the demonstrations with people who had space to offer […and built…] what has become a broad suite of web tools built specifically for Occupy activists. Using their own flavor of WordPress’ multi-site functionality, TechOps can facilitate sites like S17NYC.org and allow individual movement groups to maintain their own web presences themselves.” Those who code may have a special understanding of the saying “free as in beer, but not free as in speech” (Judd, 2012). Franklin, in 1989, was perhaps just a bit too early to fully anticipate the complex socio-politico-economic forces that would result in Twitter, a commercial start-up, empowering the Arab Spring. But Apple’s 2009 essay describes in full the motives and methods we see manifesting in high-stakes testing and redistribution of public resources to private concerns that are part of many ed “reform” efforts. I believe there’s a need for further research into the roles of social networking within emerging communities of practice, but also its influence on communities of practices’ emerging. In the meantime, code literacy is something that’s fun and beneficial to pursue, which you can leverage within many learning environments to help create the kinds of authentic, situated opportunities for discovery and knowledge construction project- and inquiry-based learning models are touted for. And while you probably don’t have the next Dimitri Gaskin in your class, you almost certainly have more expertise available than you’ve imagine or tapped. My footnotes script is part-way to becoming a jQuery plugin. You may or may not know what that is, but I’ll wager you know someone who does. It’s only part-way done because I’m trying to think more like a programmer so I’m learning about design patterns and building in stages. The Smashing Magazine article in that link contains links to all the information one needs to finish it. In my next and hopefully final instalment I’ll talk about a project I have in mind that I think holds benefits for classroom teachers who are still tentative about technology and/or looking for creative ways to include it, one that demystifies programming and the coding culture, and hopefully creates space in the classroom for activities and knowledge that may already be taking place informally outside, extending access and creating new opportunities. * Creative Commons Attribution-NonCommercial-ShareAlike 3.0 Unported License. }), // TODO: accesskey: n has no effect. onKeyup? Apple, Michael W. (2004). Ideology and curriculum (3rd ed.). New York: Routledge. Christensen, Clayton; Johnson, Curtis W.; Horn, Michael B. (2008), Disrupting Class: How disruptive innovation will change the way the world learns. New York: McGraw Hill, 288 pages. Franklin, Ursula. (1992, rev ed. 1999) The Real World of Technology. (CBC Massey lectures series.) Concord, ON: House of Anansi Press Limited, 206 pages. It came to my attention at that time due to my involvement with a group of teacher educators at the Faculty of Education at York U, Toronto. I admit I wasn’t able to make a great deal of sense of it until they published a Primer and a guide on Authoring Practice in 2010, and even so it remains daunting. Yet I believe in ARIA and what it’s trying to do, and I know of no other meaningful solution in the works. So I was disappointed and somewhat baffled when at my job in 2011 I worked with a web project manager who was unfamiliar with ARIA, and then, in the course of the project, ended up interviewing half a dozen upcoming young developers, none of whom had heard of it either! Had the Web Accessibility Initiative’s initiative failed, …was ARIA DOA?